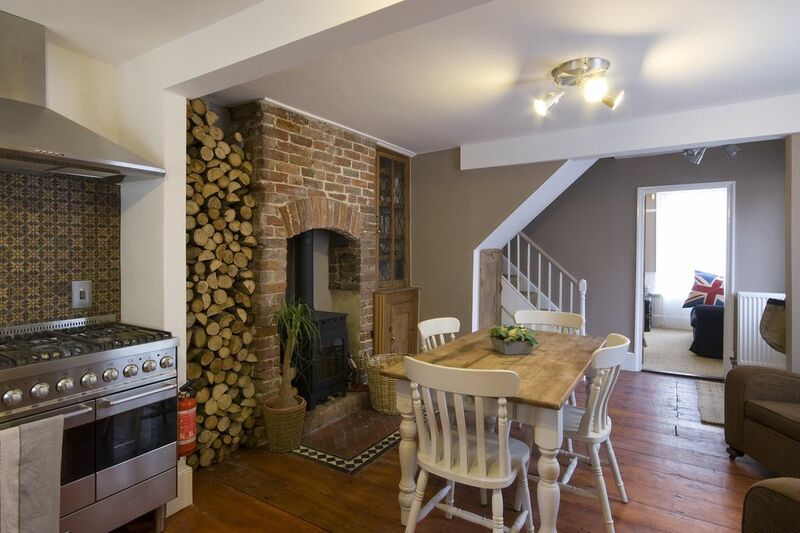 Cottage in Whitstable - 100 Yards From The Beach, Harbour And High Street. High Standard. Recently refurbished, this double fronted sea cottage is ideally situated in a quiet street 100 yards from the beach, harbour and vibrant high street, in the very heart of the Conservation Area. High standard of equipment and furnishing throughout, with an eye for detail. Ideal for friends, couples or families alike. Cleverly designed, the cottage can accommodate up to 6/8 people, using the attic room (converted for the owner's use - low ceiling). We wanted to be very close to what Whitstable has to offer and be able to rest in a peaceful environment at the same time. This was just the perfect location. Calm, authenticity and fresh air. Family Bathroom: wc, basin, bath with shower head, cupboard. Baby gear. 2 sofas, fireplace, LED TV, DVD player, Ipod dock station, magazines, books, 50 DVDs. The heart of the house! High end appliances: fridge, freezer, piano cooker, microwave, washing machine, dishwasher, kettle, Nespresso (bring your own)... Table for 6, high chair, wood burner (please replace wood), 2 armchairs. Generous dinnerware. The 2nd floor stairs are steep and are therefore not suitable for all. Notes on accommodation: Heating: gas central heating, wood burning stove (please replace wood), coal fireplace. Kitchen: 6 ring range gas / 2 oven cooker, extractor, butler sink, fridge freezer, washing machine, dishwasher, toaster, microwave and Nespresso coffee machine (bring your own capsules). Lounge: LED flat screen TV (Freeview), DVD player, Ipod dock station. Patio: barbecue, table, chairs. Kids gear: travel cot, high chair, cutlery, toilet seat, toys, books. Entertainment: plenty of DVDs, books and magazines, games. Outside: Courtyard with breakfast table and barbecue. Cleaning / Towels / Linen / Maid service: Quality towels and linen included. Property professionally serviced/cleaned once a week. Other: The stairs to the attic room are steep, which would make this room unsuitable for people with mobility issues. Super relaxing weekend in this cosy cottage right behind the harbour and 1 minute from the great high street. Owner very flexible, it was a real plus. All that 1:30 min from London ! The cottage was easy to find. We loved the special bedroom under the roof. Everything we needed was present in the house. The property was clean and well-maintained. We loved the beautiful harbor, the fishrestaurants and the impressive oyster-farm in the sea. Fantatstic stay in Bexley Cottage! The six of us enjoyed this great little town which is so lively and authentic. The house is perfectly located, seconds from the beach, the harbour and the high street. We loved the deco and the cosy atmosphere. Stairs to reach the top floor are steep - better be sober! We managed to park the cars as the turnover in surrounding streets is decent. We had a great lunch at the Pearson's Arms - do book in advance. Marvellous break - we will be back! Very nicely done house. The 6 of us enjoyed the ground florr on the evening and could even light a BBQ in the small courtyard. The owner clearly gave a lot of thoughts into this. We have also been provided with great recommendations - we did like that. Whitstable is vibrant - nice to see a true high street with real shops! Try the oysters - pricy but worth it! Beautiful property in the greatest location! Seamless booking process and property is beautiful. A few mins walk away from beach, restaurants and bars. A weekend wasn’t long enough, we’ll definitely be booking again soon and staying for longer! Really comfortable, quirky, homely cottage. Clean and everything in the kitchen needed for self catering. Perfectly located for easy access to the harbour, town and rail station. Would definitely book it again! Thank you. 100 yards from harbour and beach. Directions: Take the Whitstable exit from the A299. Follow signs for Whitstable. Drive down Borstal Hill, through traffic lights and under a railway bridge. Continue through the high street until you pass the harbour on your left. Turn right into Bexley Street before you get to the traffic lights. The house is 150m down on your left hand side.